Guardian Heroes[a] is a 2D side-scrolling beat 'em up video game in the vein of Final Fight or Golden Axe, but with RPG elements. The development team called it a "fighting RPG". Guardian Heroes was developed by Treasure and released in 1996 for the Sega Saturn video game console. A sequel was released in 2004 for the Game Boy Advance entitled Advance Guardian Heroes. The game allows players to alter the storyline through their actions, such as choosing between a number of branching paths, leading to multiple endings, and killing civilians and enemies, leading to changes in the Karma meter. The music was composed by Hideki Matsutake, a former member of electronic music band Yellow Magic Orchestra, and Nazo Suzuki. It is considered a cult classic of the beat 'em up genre. In addition to story mode, the game includes a versus mode wherein up to six players can compete using any of the main characters (and unlockable monsters, bosses, and civilians) in a timed battle or to the death. The players earn experience points during each scene, and between scenes are able to improve and customize their characters with six attributes: Strength (determines physical damage per hit and distance enemies fly when the player hits them), Vitality (determines HP), Intelligence (governs size and strength of spells), Mentality (determines how many MP the player has and how fast MP are recovered), Agility (determines the speed at which characters can do physical and magical attacks) and Luck (modifies damage the player gives and receives, in addition to improving Nicole's selection of spells). The game's story mode has multiple paths. The player can choose where they will go and what they do after every level. Different paths lead to different endings, bosses, and levels. The battlefield has multiple levels. Initially, the player can only access three planes of battle: a foreplane, a middle plane, and a back plane. These planes can be switched between in set sequence, or at the player's choosing based on which button is pressed. Often, evasive actions can be taken by switching a plane. A supreme being created the universe to find ultimate warriors to hire as its personal soldiers. A vicious battle was waged between the Earth and Sky Spirits (renamed the Earthblood and the Skyborn in the Xbox 360 Remix). The Sky Spirits bestowed incredible powers upon the humans, effectively making powerful wizards for their own gain. The human wizards joined the effort against the Earth Spirits, banishing them into the darkness. Soon after this was accomplished, the Sky Spirits grew fearful and jealous of the humans, and banished them all into the darkness with the Earth Spirits. Mankind instead opted for a more physical approach to life, and the Time of the Sword began. One of the human wizards, Kanon, escapes his imprisonment with the Earth Spirits, and comes back to the surface to get his revenge on the Sky Spirits. There, he brings his case up with the existing khans. Since they do not trust him, he destroys them and replaces their kingdom with a wizard kingdom, with puppet khans to do his will. The former king prophesied, prior to his death, that should his reign and the Time of the Sword be brought to such an end, then the sword would resurface and in turn bring an end to Kanon's reign. As a precaution, Kanon banishes every existing sword in his new kingdom, but he overlooks one particular sword, belonging to a fierce, anonymous warrior who fought to the death during Kanon's takeover. Also, the former princess Serena survives the ordeal, and joins the band of knights to try to bring about Kanon's end from the inside. At the game's start, four warriors – Han, Randy (with his pet rabbit, Nando), Nicole and Ginjirou – find the sword of the valiant warrior. Serena arrives to warn them that the knights have learned of their possession of the sword, and are coming to take it back. The four flee their home as it bursts up in flames during the invasion, then escape the town via separate ways, rendezvousing at the graveyard nearby. The leader of the Black Knights, Valgar, awaits them there, accompanied by a powerful robotic warrior. They are unable to damage it with normal weapons, and Han resolves to use the new sword against the robot. The sword is struck by lightning, electrocuting Han and causing him to lose his grip on it. The sword then floats over to the burial mound of its original owner, who rises up in zombie form. Enraged, he obliterates Valgar's robot, and attacks Serena. However, the five discover that the warrior obeys any command that they give. They resolve that, with this new ally, the time to begin an attack on Kanon's new kingdom is at hand. From here, the story splits into various paths. Some involve ultimately fighting against the Sky Spirits, Earth Spirits, and/or the supreme being that made the universe, while others wind up with the warriors ultimately defeating Kanon, only to have to defeat Super Zur, or various rogue robotic warriors that he had left behind, led by the nefarious Golden Silver. According to former Treasure designer Tetsuhiko "Han" Kikuchi, Fill-in-Cafe's Mad Stalker: Full Metal Force and Capcom's Alien VS. Predator arcade game were the main inspirations for Guardian Heroes' design. When asked why Treasure chose to develop a 2D sprite-based game when video game sales were increasingly dominated by 3D games, and when nearly every other Saturn developer was concentrating strictly on 3D games, a Treasure representative commented, "Treasure has built up a tremendous knowledge of 2D sprite know how. It's an asset that we wish to continue using. ... No we didn't think it was risky. In fact the risk is in trying to make a new game. There [are] a lot of companies that have tried and failed to make successful 3D games. Besides, 2D and 3D games can exist alongside each other." For the XBLA release, Tetsuhiko Kikuchi returned to create new artwork and assisted development. On May 5, 2011, Sega of America and Sega Europe announced a remastered version of Guardian Heroes for Xbox Live Arcade for Fall 2011. It was announced on September 6 that the game would be released on October 12. The port makes numerous changes to the original. It has been reformatted for 16:9 aspect ratio, expanding the playfield. The game features both original and "remix" graphics modes and runs in high definition with a remade user interface in both. The remix mode applies an hqx-like upscaling filter along with a pencil-shade effect to the sprites, implements true alpha blending, applies bilinear filtering to the backgrounds and features redrawn spell effects and character portraits. Players can also choose between original and remix options for the gameplay. Remix mode makes many changes to the game's control and mechanics, but does not impact level design or content. Some of these changes, like the new attacking and dodging controls, air dashing, and air recoveries, were modeled after Treasure's own Bleach: The Blade of Fate, a fighting game that likewise features elements of Guardian Heroes. The script for Story Mode has been rewritten and contains updated dialogue as well as changes in name to the Earth and Sky Spirits, who are now known as the Earthblood and the Skyborn, respectively. The XBLA release also features online play for the multiplayer modes, and an expanded competitive mode that allows for 12 players instead of six. Arcade Mode, an endless survival gauntlet, is a new addition. The game was well received. The four reviewers of Electronic Gaming Monthly praised the game's combos, multiple paths, and inclusion of a versus mode. Rad Automatic of Sega Saturn Magazine also praised the multiple paths through the game, but expressed the most enthusiasm about the high difficulty and the three layers on which the action takes place. He concluded, "Innovative, challenging, exciting and tough, Guardian Heroes is a classic in every way." GamePro's Scary Larry lambasted the game's long-winded dialogue and graphics, saying that "these poor, simpering graphics have no place on a next-gen machine. Colorful doesn't always mean clean, and there are plenty of jagged edges, pixelated fighters, and breakup." Despite this, he gave the game a strong recommendation, describing it as the true successor to the Streets of Rage and Golden Axe series. He elaborated that Guardian Heroes retains all the fun of Streets of Rage's beat 'em up action and enhances it with new additions like multihit combos, linking moves, and a branching storyline with multiple endings. Yasuhiro Hunter of Maximum said that "Treasure's first attempt at a next gen game combines everything they do best - frantic action and an in-depth storyline with great character design." He reported that the action and RPG elements are both easy enough that enthusiasts of either genre would find the game accessible. He also highly praised the game's replay value. A reviewer for Next Generation had a more mixed reaction than other critics, commenting that "Guardian Heroes may be the pinnacle of the [side-scrolling beat-'em-up] genre, but even the best is still a bit on the mindless side." He remarked that while the graphics, lack of slowdown, and six-player versus mode would thrill die hard beat-'em-up fans, the average gamer would find the game fun but repetitive and lacking in originality. Electronic Gaming Monthly awarded Guardian Heroes Side-Scrolling Game of the Year, explaining that, "The different characters, the numerous special and magical attacks, the branching story lines, the Versus Mode and the anime style all combined to make Guardian Heroes one of the best, most memorable games of '96." Retrospective feedback on the game has continued to be positive. IGN staff writer Levi Buchanan ranked Guardian Heroes third in his list of the top Sega Saturn games. 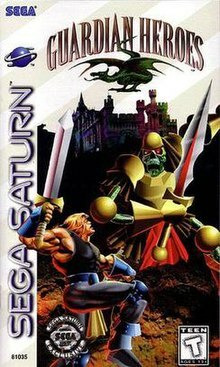 GamesRadar ranked it as the 5th best Saturn game, stating that "Treasure's original 1996 release remains a wonderful co-op beat-'em-up experience with impressive presentation and exciting combat" WatchMojo.com voted it as the 7th best Saturn game, praising "the beautiful hand-drawn sprites and elaborate backdrops." It was ranked as the 4th top beat 'em up video game of all time by Heavy.com in 2013, while ScrewAttack voted it as the 5th best beat 'em up of all time. ^ "Tonight We're Going to Party like it's 1996!". Sega Saturn Magazine. No. 16. Emap International Limited. February 1997. p. 10. ^ "Guardian Heroes". GamePro. IDG (85): 95. October 1995. ^ "Guardian Heroes Tech Info". GameSpot. Archived from the original on October 18, 2012. Retrieved 2011-06-12. ^ November 2012 issue of Nintendo Power magazine. ^ "The Treasure Interview". Maximum: The Video Game Magazine. No. 7. Emap International Limited. June 1996. pp. 108–9. ^ Cox, Austin (5 May 2011). "Sega Saturn Classic Guardian Heroes Announced for the XBLA". Gameplay Today. Archived from the original on 23 March 2012. ^ Hryb, Larry. "Guardian Heroes and Operation Flashpoint: Red River are coming to Xbox One Backward Compatibility today". Retrieved 20 December 2017. ^ a b "Review Crew: Guardian Heroes". Electronic Gaming Monthly. No. 83. Sendai Publishing. June 1996. p. 26. ^ a b Hunter, Yasuhiro (June 1996). "Maximum Reviews: Guardian Heroes". Maximum: The Video Game Magazine. No. 7. Emap International Limited. pp. 125–6. ^ a b "Guardian Variety". Next Generation. No. 17. Imagine Media. May 1996. p. 91. ^ a b Automatic, Rad (June 1996). "Review: Guardian Heroes". Sega Saturn Magazine. No. 8. Emap International Limited. pp. 64–65. ^ "ProReview: Guardian Heroes". GamePro. No. 94. IDG. July 1996. p. 70. ^ "The Best of '96". Electronic Gaming Monthly. No. 92. Ziff Davis. March 1997. p. 88. ^ Buchanan, Levi (2008-07-29). "Top 10 SEGA Saturn Games". IGN. Retrieved 2013-04-03. ^ "Best Saturn games of all time". gamesradar. Retrieved 2016-04-15. ^ "Top 10 Sega Saturn Games". WatchMojo.com. Retrieved 2016-04-15. This page was last edited on 28 March 2019, at 00:54 (UTC).